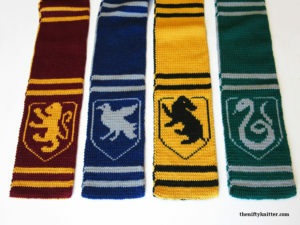 10 points to Gryffindor! 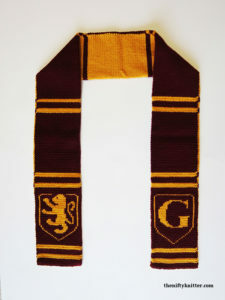 Show off your Gryffindor spirit with this scarf inspired by the Harry Potter house. 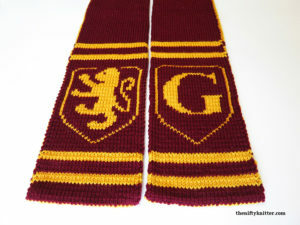 Gryffindor Spirit Scarf is a thick, reversible, double knit scarf, perfect for those cold weather Quidditch games! 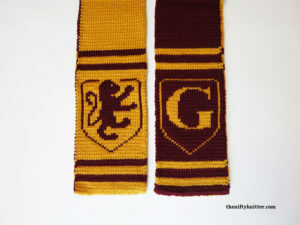 One end features the Hogwarts house crest, while the other end can feature either the house initial or the crest. 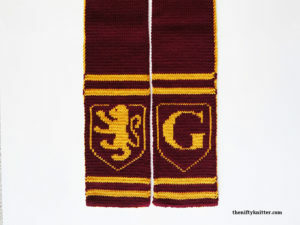 Approximately 300-325 yards each of worsted weight yarn in scarlet and gold for a 66 inch (168 cm) length scarf. Length can be increased or decreased in 9 inch (23 cm) intervals.